Do-It-Yourself Desk Signage Kit Makes Personalizing And Branding Your Office A Breeze. Blank Insert Sheets Allow You To Print Customized, Professional-Looking Signage With Any Laser Printer. Clear, Nonadhesive Inserts Create An Elegant Appearance That Resembles A Permanently Engraved Sign. Easy-To-Use Design Lets You Quickly Reuse Signs By Simply Switching The Printable Insert. Shatterproof Lenscovers Are Engineered With Specific Tolerances Combined With The Isometric Design That Creates A 3d Look To Gracefully Protect Your Graphic And Text. Desk Signage Kit Includes Nameprint Graphics Design Software, Brushed Silver Steel Plates, Polished Silver Desk Stands, Clear Lenscovers And Printable Insert Sheets.. 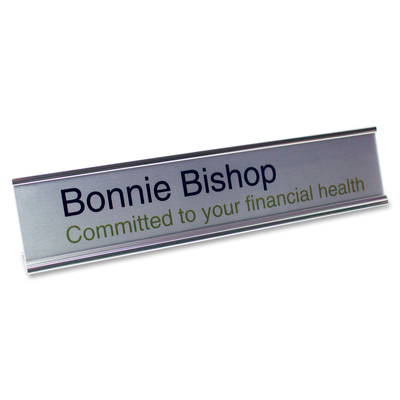 Do-It-Yourself Desk Signage Kit Makes Personalizing And Branding Your Office A Breeze. Blank Insert Sheets Allow You To Print Customized, Professional-Looking Signage With Any Laser Printer. Clear, Nonadhesive Inserts Create An Elegant Appearance That Resembles A Permanently Engraved Sign. Easy-To-Use Design Lets You Quickly Reuse Signs By Simply Switching The Printable Insert. Shatterproof Lenscovers Are Engineered With Specific Tolerances Combined With The Isometric Design That Creates A 3d Look To Gracefully Protect Your Graphic And Text. Desk Signage Kit Includes Nameprint Graphics Design Software, Brushed Silver Steel Plates, Polished Silver Desk Stands, Clear Lenscovers And Printable Insert Sheets.